Each all-natural blend is inspired by a special number and enhanced with a cluster of crystals. We did the math— you're about to smell lovely. Fans of numerology, astrology, and any 'ology that creates dreamy signature scents will fall for Jordan Foraleza's all-natural rollerball. Each is blended with your special number in mind, whether it's the one that brings you luck or the one that's written in the stars. For even more feel-good vibes, a cluster of crystals is added: Sevens, for example, are treated to mother of pearl (calmness) and 22s get electrifying lapis (creativity). And if celestial cycles are your thing, know that these fragrances are crafted during a full moon. Hand-crafted in Los Angeles. Click here for our complete numerology guide. After years of using mainstream beauty products and luxury perfumes, Jordana Fortaleza started having allergic reactions to the harsh chemicals in her favorite brands. She researched natural alternatives and discovered there weren’t enough options. 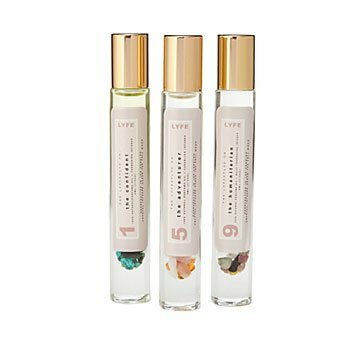 So, she took her affinity for crystals and their healing properties, passion for clean beauty, and love of fragrance, and created her own line. Jordana makes her signature blends in Los Angeles.